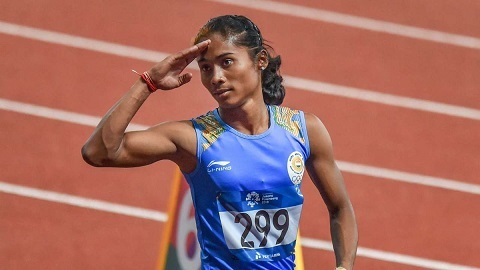 Sprinter Hima Das has been disqualified for false start in women’s 200 m semifinal on Tuesday evening at the Asian Games 2018 in Jakarta of Indonesia. However, India’s Dutee Chand entered the final in the same event clocking 23.00 seconds. It may be mentioned that Hima Das qualified for semifinal in women’s 200 m race in the morning on Tuesday finishing fourth in her heat. \The 18-year old sprinter, after finishing sixth in the Commonwealth Games 400 m final in Gold Coast in April, has gone onto improving her timings. She lowered the Indian U-20 record in 400 m to 51.13 seconds while winning gold in the recent National Inter State Championships in Guwahati.